If the vehicle can no longer be locked or unlocked with the SmartKey, use the mechanical key. If you use the mechanical key to unlock and open the driver's door, the anti-theft alarm system will be triggered . ■ Insert the SmartKey into the ignition lock. ■ To deactivate the alarm with KEYLESSGO: press the Start/Stop button in the ignition lock. The SmartKey must be in the vehicle. ■ Lock or unlock the vehicle using KEYLESSGO. The SmartKey must be outside the vehicle. If you unlock the vehicle using the mechanical key, the fuel filler flap will not be unlocked automatically. ■ To unlock the fuel filler flap: insert the SmartKey into the ignition lock. 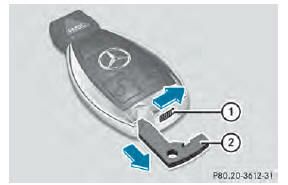 ■ Push release catch 1 in the direction of the arrow and at the same time remove mechanical key 2 from the SmartKey.